Fun Free Printable Football Activities! Miles from Tomorrowland Free Printables, Crafts, Party Supplies and More! Disney Junior invites you on a mission to the stars! Miles from Tomorrowland, Blasts onto Disney Junior! February 6th at 9am/8c! A former pro-surfer dad, a warm-hearted mom, an Einstein sister and an adventurous boy all come to life in this new Disney Junior Series. Throw in a Robo-ostrich and there will be adventures like no other! Miles from Tomorrowland loves adventures and exploring space with his best friend Merc. Their escapades will blast through the stars with the help of his great sister Loretta, his Mom Phoebe and his dad Leo. Miles’ dad is an awesome inventor, pilot, and former pro-surfer. He’s laid back and can stay utterly cool, even when flying through space junk. A passionate engineer, he’s never afraid to try something new in hs workshop. Captain Callisto is also Captain Mom and runs the ship with a warm heart, high standards, and a take-charge personality. A born Leader, Phoebe sets a great example and encourages her family on every mission. Loretta researches and records new discoveries and has the answer to almost any question in the Universe right on her wrist with her Bracelex. She is a brilliant computer coder and a great older sister to Miles. She always has his back Miles’ best friend is his robo-ostrich Merc (a Mechanical Emotionally-Responsive Creature). Programmed to have feelings – and fully loaded with an extensible neck and rocket boosters – he’d do anything to keep Miles safe! Miles is a space adventurer who’s always ready for action. He blasts through the Universe with his best friend, Merc, a robo-ostrich. Together they journey to new worlds, discover alien creatures, and make galactic discoveries. In anticipation of Miles from Tomorrowlands TV debut, Disney Junior has released several printables featyuring characters from the TV series! These printables are free to download! Simpley click the images below and save the PDF! 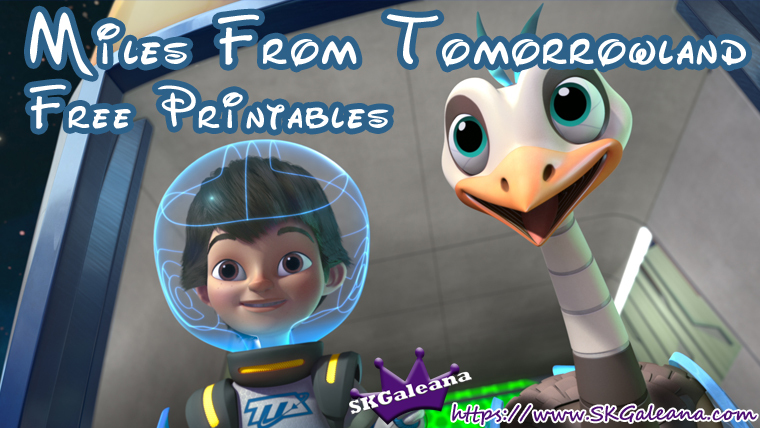 All the printables were found on the Miles from Tomorrowland Disney Junior website. Be sure to check out their website for more information, awesome pictures and digital games that the whole family will enjoy! The printables below feature almost everything you need to have an epic Miles from Tomorrowland premiere party, complete with invitations, cup wrappers, recipe cards, and Treat toppers! Activities are also available to help the kids have a blastastic good time with a word search, connect the stars (connect the dots), Matching Game, Space helmet and Merc mask, Galactic ID Badge and more! Pass out trading cards and let the kids try to collect them all! There is so much fun in these free printables that everyone will feel like space travelers!